What are they building in 'Construction'?! What are they building in ‘Construction’?! I set out on a walk last week. As I approached a building site on my street, I noticed a woman with a baby and a little boy, about three years old, standing fixedly at the site fence, gazing at the holes in the ground, the cement mixer and the piles of bricks. Twenty minutes later, as I finished my walk, I saw that this little party were still there, the little boy now talking animatedly as he pointed things out to his mum. A wave of nostalgia hit me – when my kids were preschoolers, I clocked up plenty of hours standing in front of construction sites as well! “Dig the ground. Dig the ground. Bore down in the mud. Shove the piles in one by one. 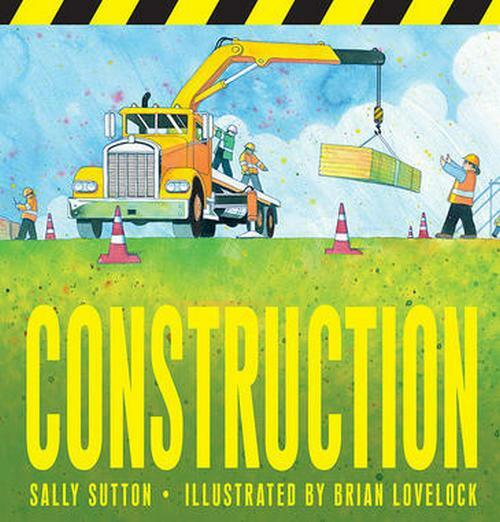 There’s a nice ‘glossary’ on the last page for those readers who want some more detail about key construction vehicles however Lovelock’s bright, appealing illustrations provide lots of detail for aspiring builders to pore over. Construction is suitable for children aged two years and over. Find it in all good book stores or online at Fishpond. 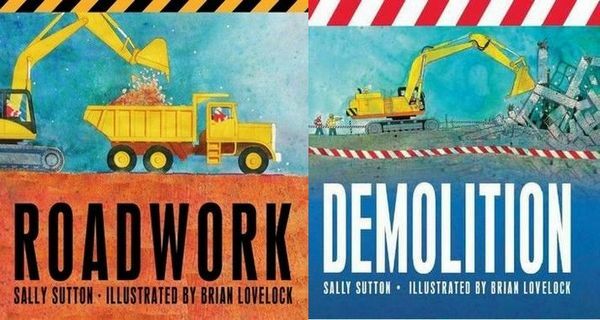 For more books by Sally Sutton for building fans, check out Roadwork and Demolition.